When you’re in the bourbon section of your local liquor store, you can’t go wrong with any of our fine Lux Row offerings. But even then, you have some choices to make. If you’d like to be a more confident shopper — or you just want to impress people at dinner parties — read on to learn how to interpret that sometimes-mysterious bourbon label. Some label prose is self-explanatory in describing how a particular bottle offering is produced, but other terms could use some clarification. First, recall that all whiskey must be made from a fermented grain mash — Scotch primarily from barley, rye from rye. Bourbon must have at least 51 percent corn in its mash, and then it may include other grains. But bourbon can only be called bourbon if it’s made in the United States (preferably in Kentucky!). Where the bourbon was distilled, aged, and bottled will be somewhere on the label, along with the producer, whose name may be different than the brand. Although there is no minimum aging period for bourbon, the label will indicate “straight bourbon” only if it’s been aged for at least two years in new charred oak barrels. A “single barrel” bourbon like Rebel Yell Single Barrel means a single barrel is bottled and not blended with other barrels. A “sour mash” indicates the addition of the stillage from a previous distillation to the next mash cook or fermenter. If all of these terms are making your head spin, brush up on your bourbon lingo here. 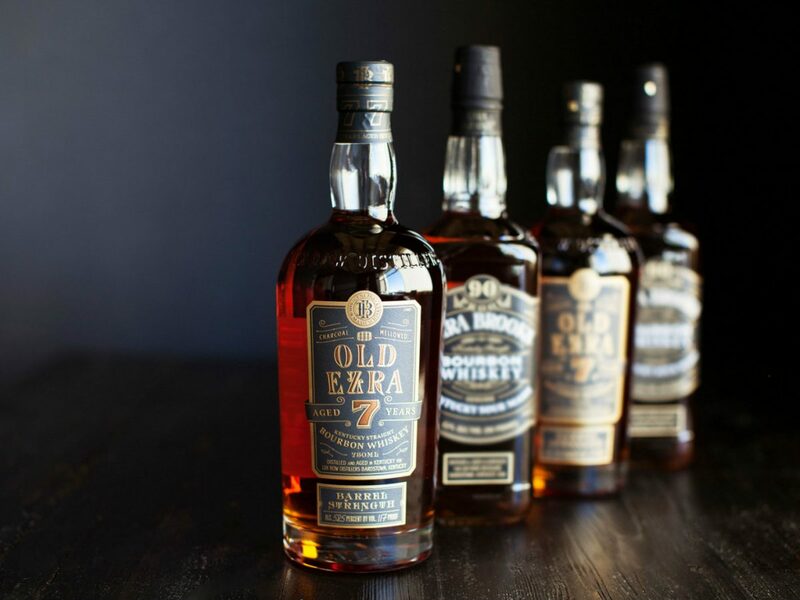 When you see an age on a bottle — like the “Aged 7 Years” on the Old Ezra label — it may be a blend of different aged whiskies or not. In any case, the indicated number of years aged always refers to the youngest of the whiskies in the bottle. Once it’s bottled, the flavor of the bourbon won’t change. So the age on the label — and the appeal of older vintages — means it has spent that many years in the barrel. Bourbon is typically filtered and diluted with water following maturation. When it’s not, look for the term “barrel proof” or “barrel strength” (Old Ezra, again). The strength of a bourbon is indicated by its percentage of alcohol by volume, or ABV, which is always half of its indicated “proof.” Thus, a 98.6 proof bourbon like Blood Oath Pact No. 4 is 49.3 percent ABV. Bourbon can range from 40 to 80 percent ABV, or 80 to 160 proof. The volume of the bottle has been noted in milliliters since 1980. So while 750ml is not quite a fifth of a gallon and is more accurately called a “metric fifth,” the old term of “a fifth” is still commonly used. The government health warning on every bottle has been a federal requirement since 1989. That should be all you need. Although it may take time and sampling to determine what factors go into creating a personal favorite, you’re now ready to start shopping for the spirit, or spirits, of your choice.